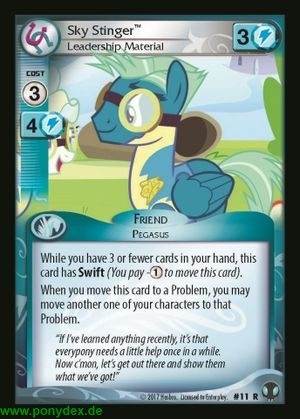 While you have 3 or fewer cards in your hand, this card has Swift (You may move this card for 1 fewer action tokens.). When you move this card to a Problem, you may move another one of your characters to that Problem. "If I've learned anything recently, it's that everypony needs a little help once in a while. Now c'mon, let's get out there and show them what we've got!"